Gum disease is one of the most prevalent dental conditions in the adult population. It is caused by plaque and tarter accumulation at or below the gum line, as well as by a variety of health problems. The early stage of gum disease, gingivitis, is swollen gums and is reversible. 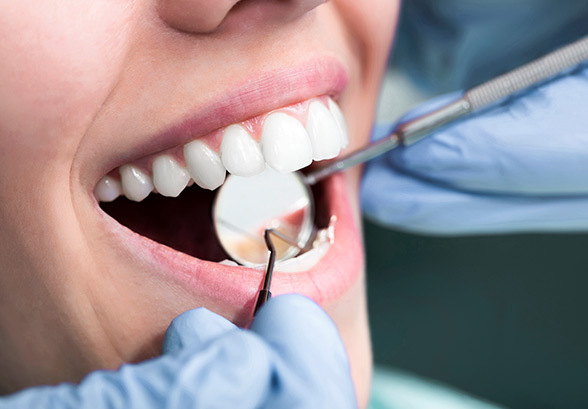 If left untreated, gingivitis progresses to periodontitis – a much more serious condition. In periodontitis, the bone and ligaments that hold teeth in place begin to degrade. Otherwise healthy teeth loosen, shift or fall out in advanced stages Studies link gum disease to heart disease, premature birth and other systemic conditions. Periodontal therapy begins with cleaning tarter from root surfaces BELOW the gum line. Under local or topical anesthesia, we thoroughly clean and smooth the root surfaces and remove accumulated bacterial toxins from roots. This is different from a routine cleaning in which there is no disease process present and the cleaning is a preventive measure. More frequent maintenance visits are required after initial therapy is completed.